Another Tripath amplifier but monoblock! For a few months I have been experimenting with a monoblock power amplifier module based on the STA508 and TC2000 chipset from Tripath and assembled into a convenient package by Helder HiFI in China. The recommended power source is a 24v SMPS (switched mode power supply) which is where I started. The SMPS units are easily available from our favourite online auction site and I tried the amps using firstly one and then two to provide a separate regulated supply for each channel. These power supplies worked well and make for a very efficient amplifier. After some research on the web I settled on a regular style power supply using dual transformers, rectifiers and smoothing capacitors. The Transformers were again puchased from Ebay and the rest of the components I happened to have in the spares box. The power supply and amplifier modules were built into inexpensive plastic cases from Maplin, they look ok and being plastic are easy to work. The ampliers were assembled in one chassis and psu in the other with no major machining required, just drill a few holes. 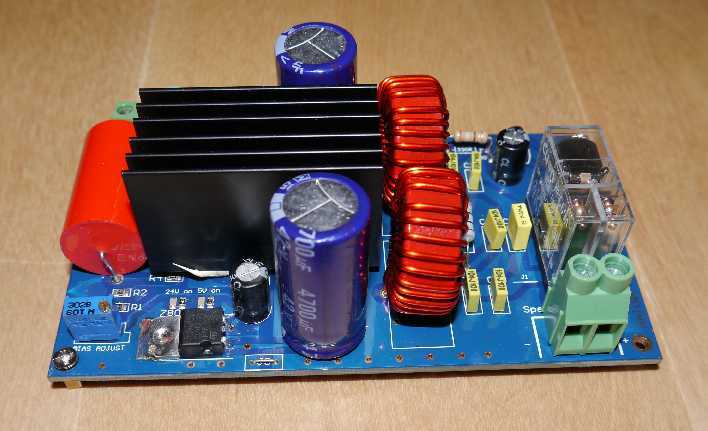 The amplifier modules are supplier built and tested with screw terminals for all connections, the only soldering required is for the connectors on the back panel and the wiring in the power supply. As you can see these amplifier modules are built with good quality components, especially the chokes in the output filter. If you are a tweaker there is a reasonable amount of space on the board for fitting alternative compononents, the input capacitor is easily removed with plenty of space for alternative types or the addition of by-pass capacitors. This review is with the amplifier modules as supplied, I may look at component substitution at a later time. The amplifier was left on for several days to settle in before serious reviewing, the initial impressions were excellent with good sound stage and without serious nasties. Compared with the NET Audio NA200 the sound stage width and height are both excellent, the depth is reduced a little. The resolution is excellent, on Autumn Leaves form the Eva Cassidy Album Song Bird the tape hiss and other background noise is clearly audiable. The tone of female vocals like that from Mary Black and Eva Cassidy is good in comparison to my regular amplifier, I find female vocals always a good test of an amplifier. The bass end of the amplifier is good, the bodrum on the Mary Black track "My youngest son came home today" is revealed well, some amplifiers can struggle with this track.The low organ pipes on the Bach Toccata and Fugue are clear, tuneful and display good resolution, not bad considering my power supply is probably not as good as it could be. When I get some time I must rewire the power supply with heavier guage wire and fit some by-pass capacitors across the electrolytics. If I am to be picky these amps sound a bit course at times, vocalists can sound as if they have a sore throat. This usually occurs as the volume is increased and the sound hardens up. If playing at lower volumes you are not likely to hear this affect. My concerns may be due to the less than ideal power supply arrangements, better quality components with improved wiring and layout may improve matters. Replacing the input capacitor with your favourite sounding variety may also improve matters, in my experience component selection can lift a good amplifier to higher levels, it can never fix a poor design. These amps with power supply and cases cost approximately £120, if you need to buy everything and not raid the spares box then about £150. When you compare this to my regular amplifier at £2000 they are amazing value with stunning performance. These amplifiers deliver plenty of power for most users, I expect they will struggle when presented a difficult, low impedance, load. You can purchase a better looking case, toroidal transformer, better smoothing capacitors, still have change from £500 and have an excellent looking and performing amplifier. The vendor Arjen Helder has been helpful and very responsive, shortly after receiving the amplifier modules one died but was quickly replaced. 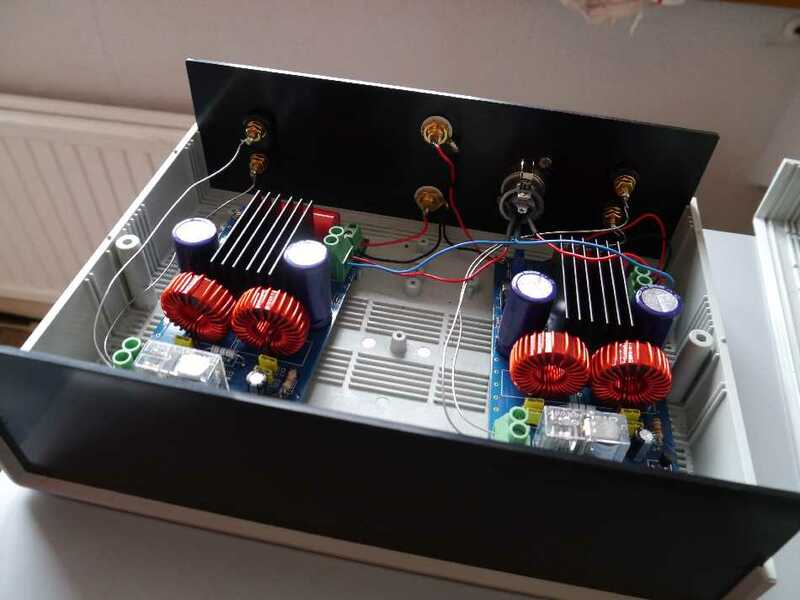 You can find Helder HiFi as a shop on Ebay where a number of different amplifier designs are available. If you like the amplifiers from Tripath take a look at the offerings from Helder HiFi.